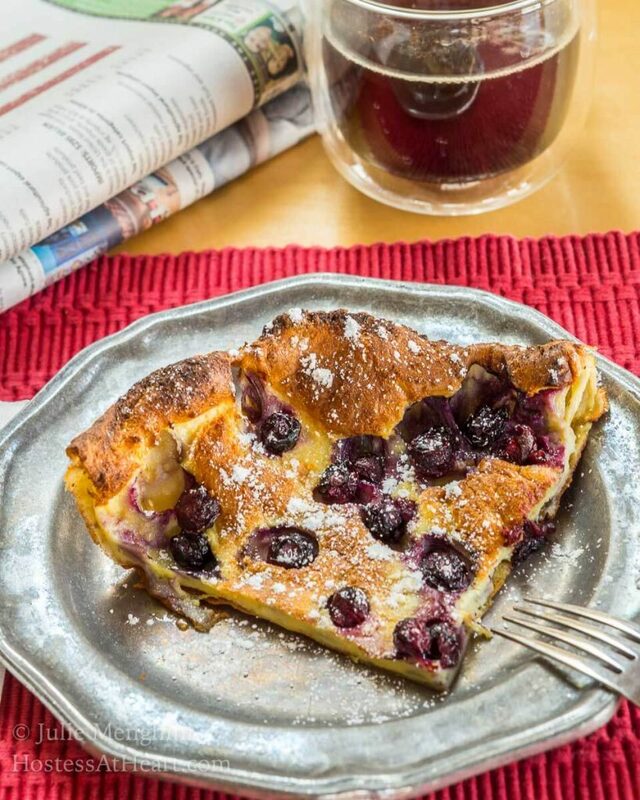 Blueberry Dutch Baby is like a buttery, tender and slightly sweet pancake. There isn’t any flipping or dripping and cleanup is a breeze. I’d never had a “Dutch Baby Pancake” before so when this month’s host Mayuri of Mayuri’s Jikoni announced that the theme for this month’s BreadBakers was Pancakes from different parts of the world I thought this was the perfect time to give this Blueberry Dutch Baby recipe a try. I saw this recipe in the Food and Wine July 2015 magazine, and it’s been waiting in the wings of my “must make” file. Most pancakes are slathered in syrup and butter. In my case, I think that’s because they can be dry and somewhat flavorless. That’s not the case with this Blueberry Dutch Baby. This Blueberry Dutch Baby was tender and buttery. The blueberries and lightly sprinkled powdered sugar gave it the perfect amount of sweetness. The syrup was on stand-by but neither John nor I thought it was necessary. The light powdered sugar was enough. 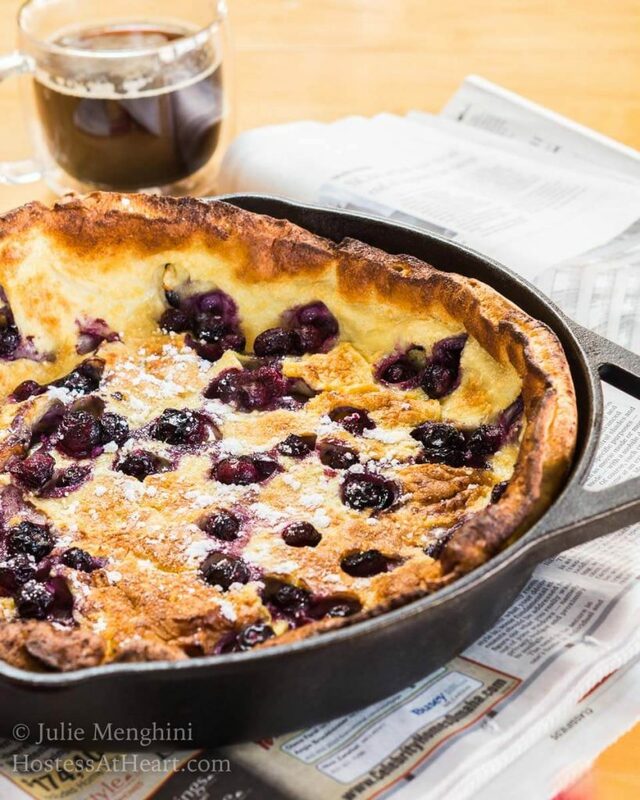 Another thing that I really liked about this Blueberry Dutch Baby is that you mix all of your ingredients together and just pour them into your skillet and bake. There isn’t any flipping or dripping and everyone gets to enjoy a hot breakfast all at the same time and clean up is a breeze. 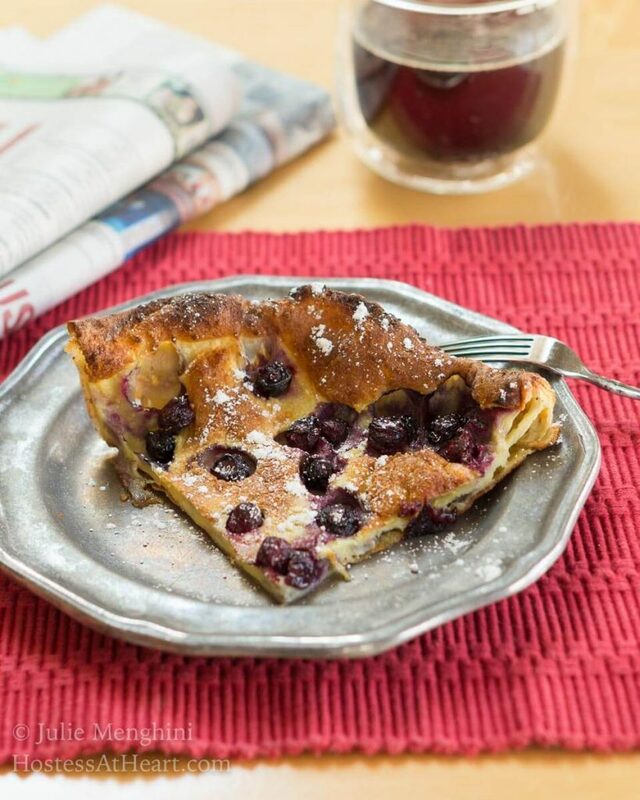 Blueberry Dutch Baby is like a buttery, tender, and slightly sweet pancake. There isn't any flipping or dripping and cleanup is a breeze. In a medium-sized bowl, whisk the flour, milk, juice, and eggs together until blended. Melt the butter in a 12" skillet over high heat until foamy. I used a cast iron skillet but use what you have. Pour batter into the skillet and sprinkle on the blueberries. Transfer the skillet to the oven and bake for 20 minutes or until golden brown. It will puff up while baking but flattens shortly after removal from the oven. Recipe adapted from Food and Wine magazine July 2015 edition. 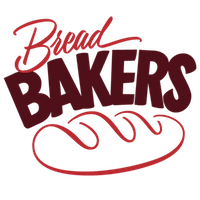 I’ll definitely be making this recipe again and will probably be adding the other Bread Bakers recipes to my “must make” file too. Thank you so much. You are so sweet for nominating me for the Sunshine Blogger’s Award. Being acknowledged by fellow bloggers is such and honor. HI.!!! Its looking delicious. I would love to try it. Thank u for the recipe. Thank you, Anamika! We loved it and I hope you will give it a try. Dutch baby… Julie, this is something completely new to me. It sounds marvelous, and the photos are perfect. Sigh… my egg allergy is the bane of my existence. But No allergies to “virtual” eggs! 😀 Mega hugs! Egg allergy? Now that’s just cruel. I’ll just save you the blueberries and wish you a marvelous day. Big hugs! wow wonderful . I want to grab the whole of the dutch baby……. Thank you, Sharanya! It is so easy to make and easier to eat. Thank you so much, Namita! They really are easy to make and delicious to eat! I just made this for dinner. While waiting for it to bake, I noticed the salt in the ingredient list, was it supposed to go in the batter? It was wonderful, anyway! Come to think of it, I didn’t have unsalted butter on hand, so that may have made up for it. I can’t wait to have leftovers for breakfast! Thank you, Patti and I am so glad that you enjoyed it! We enjoyed the leftovers too. It kept very well. No flipping is my kind of breakfast. You would be so surprised to see the mess I make when it’s a pancake day here. I agree, Jenny! I would love to know how you like this recipe. Pancakes are yummy too but have a way of taking out my stove, counters and then the pile in the sink. I have never attempted a dutch baby but I have been seasoning my cast irons so I am ready. Oh and all those yummy blueberries I have on hand will help too! You are ready to go, Jennifer! They would be perfect for breaking in those beautiful new cast iron pans. Please let me know what you think! This looks absolutely incredible! I LOVE blueberries so this is a must try! I’ve never made one either and I agree, that definitely needs to change. What a lovely recipe, the blueberries add so much too – pinning!! Thank you! I’d never had one but will definitely be making them again. You have inspired me to make a Dutch Baby!! Looks incredible! Thank you, Michaela! It was really good and I’ll be making them more often. Thank you Zeba! I hope you will stop back and let me know what you think! This sure is a special breakfast and so easy to make too! My daughter’s birthday is around the corner. This will be lovely for her brunch celebration. Thank you Sandra! I would definitely think she’d enjoy it for her birthday. I have seen Dutch baby pancakes several times, but I have never made my own. I waited to have cast iron pan… and now that I have, I could make it – yaaaas! 😀 I love that you added blueberries to this pancake -they made this pancake more appetizing! Thanks for sharing, Julie. Happy Fiesta Friday! Thank you so much, Jhuls! I love the cast iron for making them. Thank you for hosting FF this week! These look SO GOOD! I love Dutch babies and with blueberries? So good. It looks delicious. New recipe for me. Thanks for sharing. Thank you! I’m so glad you like it. I appreciate you stopping by too! 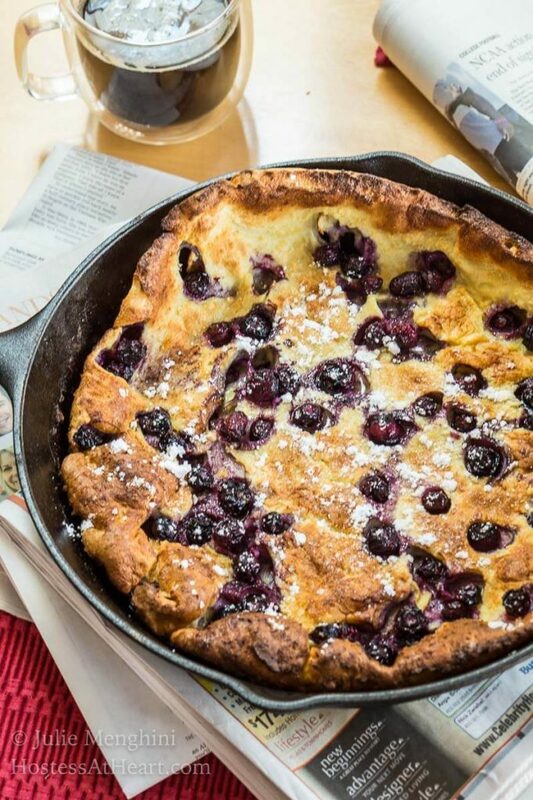 You know, Ive never had a dutch baby and every time I see a recipe I think i would love it! I NEED to try this one asap! Its sounds amazing! Thank you Angela! It was my first too and I will definitely be making them more often. I’ve never made a Dutch baby either, but I really want to try this. We often have people stay over with us at our cabin in the summer and this would be perfect for breakfast! Thank you Lisa! It is so easy and would really be special made at the cabin and shared with friends or family! This is absolutely perfect for the weekend or a special occasion! Yum! Thank you, Michelle! I think I’m making it again on Sunday. So good. This looks awesome! I’ve made these before but only plain ones. Just a question, the blueberries must be fresh in your recipe, do you think frozen ones would work. I usually keep frozen ones around, so that would be nice and easy. I love using frozen wild blueberries in baked goods, Debi. I think I would let them thaw and drain a bit otherwise, you could end up with too much moisture since there isn’t a lot of dry ingredients? If you try it, let me know or maybe I’ll get to experimenting too. Thanks Julie, I’ll let you know. I’ve been learning a bit about them now since we bought a few too many bags of them the other day. But they are so good! I am always looking for easy recipes. This dutch looks very delicious and easy to make! Thank you, Agness! This is definitely a quick and easy recipe that we really enjoyed. I hope you will give it a try. This looks delicious! Would be perfect as a dessert too. Thank you, Sneha! It would make a good dessert especially if you don’t like overly sweet desserts. I like easy! This is a beauty. Thank you, Patti! Me too. This is so easy, like a cross Between Cake and pancake. Will try soon!! Thank you, Sonal! So easy and yummy! I love this skillet version. Super easy! Thank you, Cindy. Super easy and delicious! This is on my must-try list too. Your recipe brings the possibility that much closer to my kitchen, thanks! Thank you, Holly! It really is good and love that it’s easy too! Julie I loved your version of the Dutch Baby!! I made a similar one, just different berries!! I loved your recipe too Smruti! Thank you! Never baked a pancake before, love how simple the recipe is! This theme got us so mant lovely ideas! I agree Priya! It was a lot of fun and there are so many recipes that are unique for me. I’ve never tried baked pancakes before. Dutch baby looks so delicious. My mind is wondering off to how I can add tropical fruits instead of blueberries which I don’t get here. Great Sunday breakfast option. We really liked this recipe Mayuri! It was a great challenge. I can’t believe how many varieties there are. Tropical fruits would be amazing. Thank you so much, Anne. We really enjoyed this recipe and I think it’s a new favorite way to enjoy breakfast! I love how easy Dutch Babies are to make! I’ve only made it once though. I ate the entire thing in one sitting. Dangerous. LOL! You had to be full after that one. I’ve never baked pancakes before and boy I’ll be doing it again. Thank you for stopping by! Such a delicious looking pancake. Pom juice sounds like an interesting ingredient in there. Thank you Pavani. It made it sweet enough that we didn’t need to drown it in syrup. These are so good Julie and I like your version with blueberries. I learned to make these at a cooking class offered at a local Bed and Breakfast. They demonstrated an entire breakfast/brunch and the Dutch baby was a big hit! Thank you, Judi! I’d never had or made them before and we loved them. I liked that we could sit down together and both have a hot cake instead of cooking several individual ones and trying to keep them warm. I’ve never tried a Dutch baby before either. This one is simply beautiful!! Thank you Karen. I loved how rustic they looked and how delicious they tasted! Thank you, Jess! It was my first time and we really loved them. Thank you! I hope you love them as much as we did. I love pancakes such as this one and I make a similar one called crespelle and drizzle Nutella over it! I adore blueberries so will have to give this one a go next time arounddelicious!! Thank you, Marisa! I’m going to have to look up your crespelle and will definitely be drizzling Nutella over it. That’s a heavenly idea. This looks a-ma-zing and it’s so easy to make! It is interesting that you used pomegranate juice. I’m gonna have to try this recipe soon. Thank you, Ana! I think the pomegranate juice kept it sweet enough that you didn’t have to add a bunch of syrup. Happy Valentine’s Day! I love dutch baby pancakes. Thanks for sharing this recipe. Thank you, Wendy! It was a first for me and we loved them.